David Warburton, Conservative Parliamentary Candidate for Frome has welcomed the announcement of a £92,600 government repair grant to the Church of St. Luke and St. Teresa in Wincanton. An exhibition of stunning photographs taken during the papal visit to the United Kingdom in 2010 will be on display in the cloister at St Luke and St Teresa’s, South Street, Wincanton from Sunday 12th February. Wincanton's Museum and History Society start their year on Friday 13th January at the Balsam Centre with a brief AGM, followed by refreshments and a talk by Father Louis Beasley-Suffolk about the History of the Catholic Church here. Never been to Mass in a Catholic Church? You may be surprised by this description. 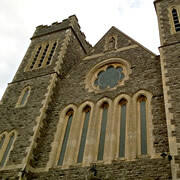 For the next couple of months St. Luke's Catholic Church is undergoing a major refurbishment. Father Louis Beasley-Suffolk yesterday completed a taxing 10 mile walk to raise funds for the renovation and refurbishment of St. Luke & St Teresa's Church.